your portrait for family and friends? 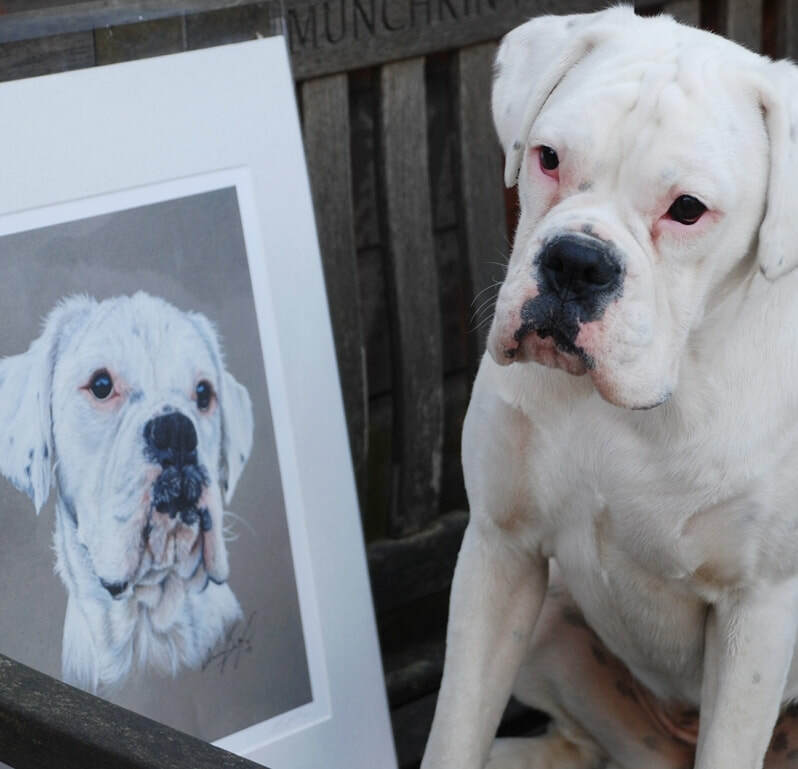 If you are looking to purchase a print or two of your own bespoke Commission or have seen a portrait on my website that you would love to own a print of, please drop me a line. 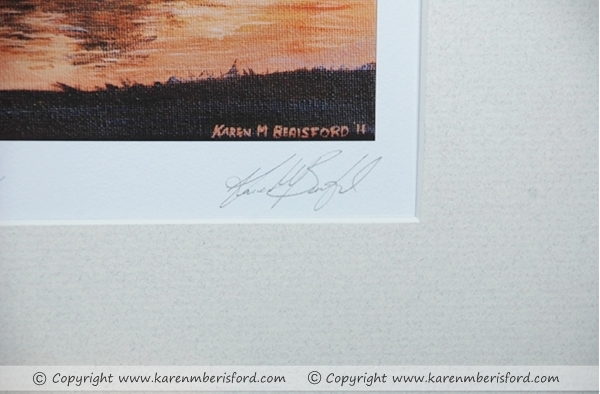 Each Giclee print is produced on a quality Hahnemuhle paper using high quality inks and are hand signed by myself. 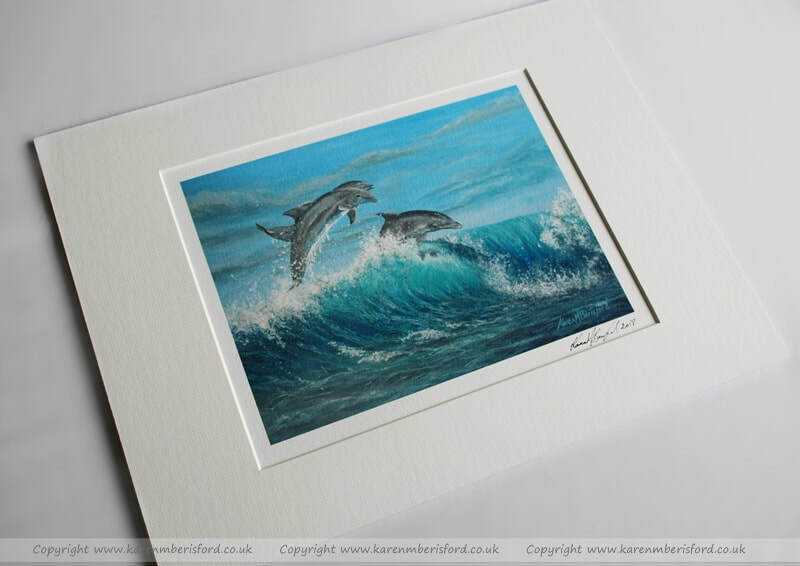 There are 2 sizes of prints available, both of which comes mounted and can be placed in a standard sized frame. A giclée (pronounced 'gee-clay') is a digitally reproduced print which closely represents the original Artwork, created via inkjet printing. The image has all the tonalities and hues of the original painting/drawing. 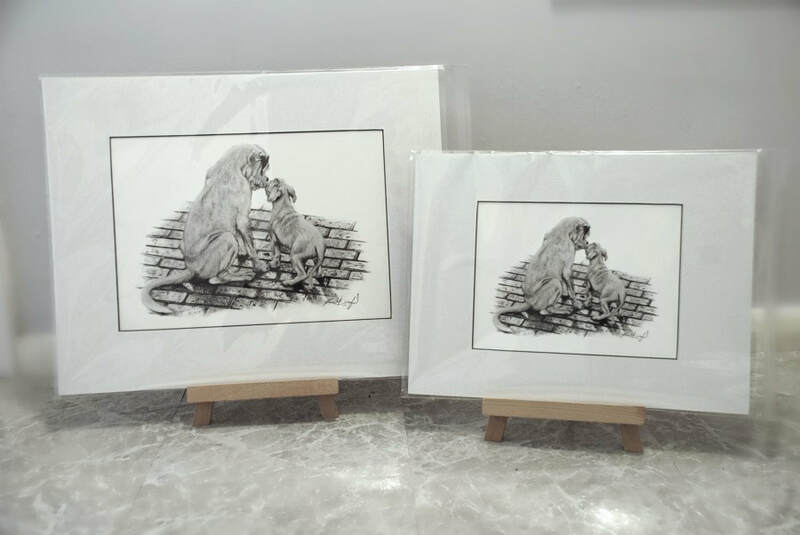 Purchasing a Giclee print is a cheaper way of purchasing a favourite piece of Art from me and if there is a piece of work on my site that you just love, there is a possibility that you can purchase a print of it. 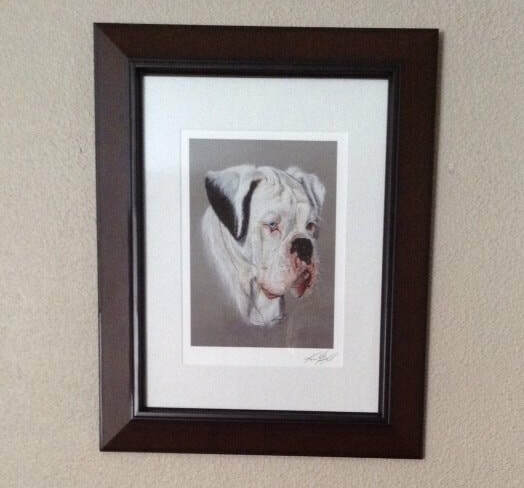 Prints can be fitted into a standard frame, exceptions if irregular sized. Costs below are for open edition prints only and commission orders. ​Discounts are available for multiple print orders - please ask. A4 - 12" x 16"
A3 - 16" x 20"
Limited Edition print prices will vary from those stipulated above because of their limited availability. 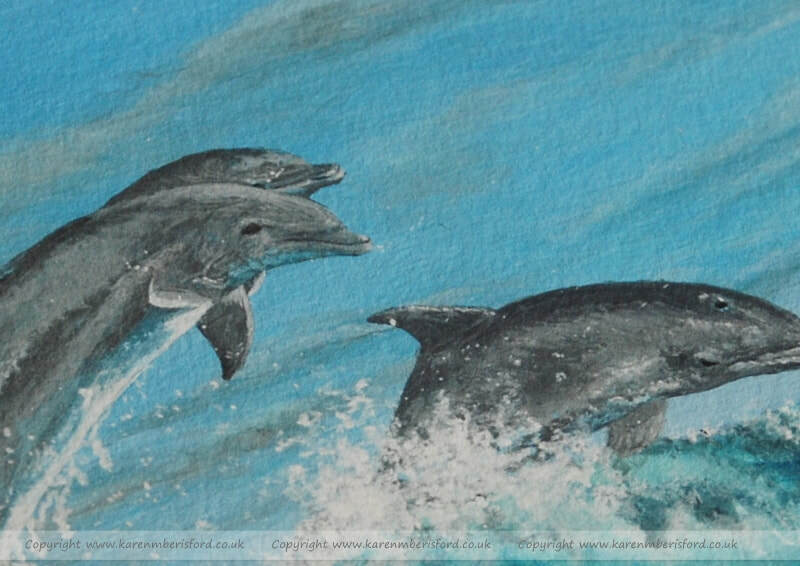 Depicting a trio of leaping Dolphins from the original Acrylic painting. 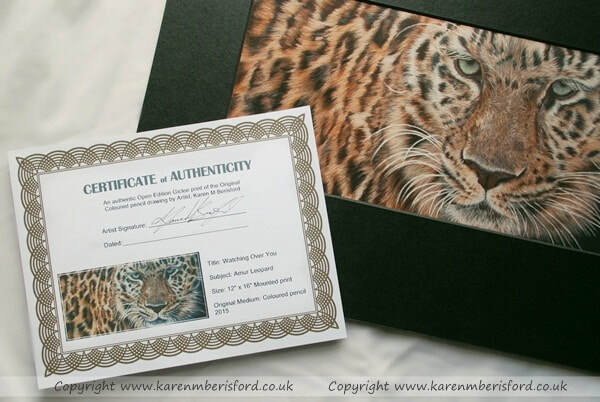 Open Edition prints available in A4 and A3 presented in an Ivory mount to fit standard size frames. 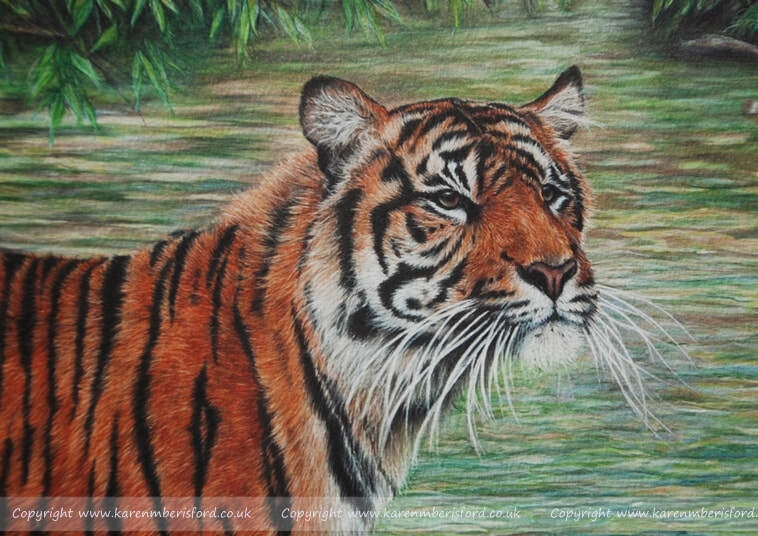 Depicting a Sumatran Tiger from the original Coloured pencil portrait. 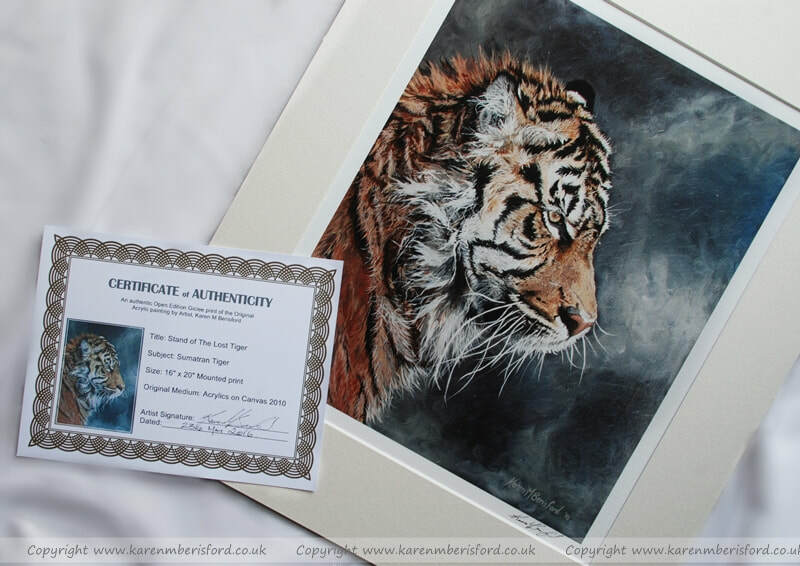 Open Edition prints available in A4 and A3 presented in an Ivory mount to fit standard size frames. 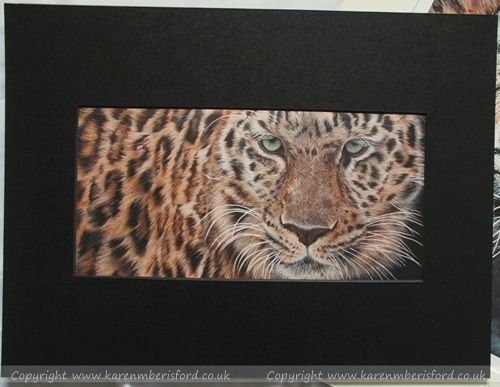 Depicting a Critically Endangered Amur Leopard which was created in Coloured pencil. Open Edition prints available in A4 and A3 presented in a black core mount to fit standard size frames. 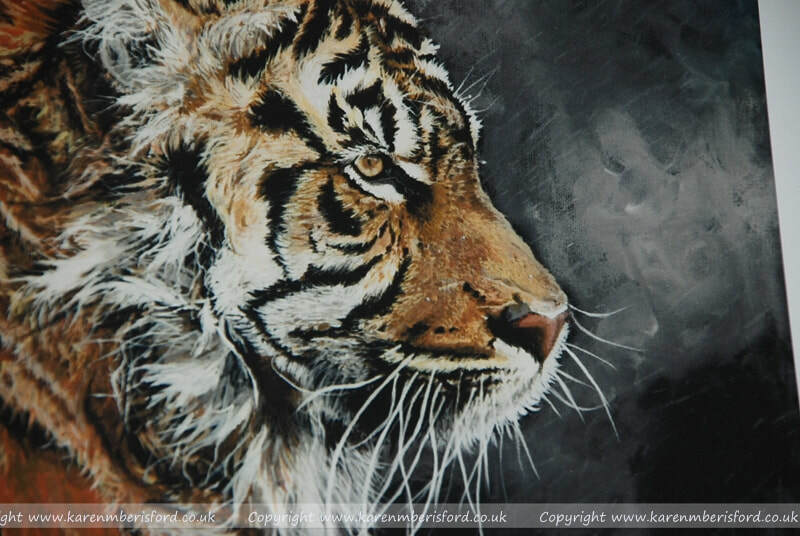 Depicting a Critically Endangered Sumatran Tiger which was created in Acrylics on Canvas. 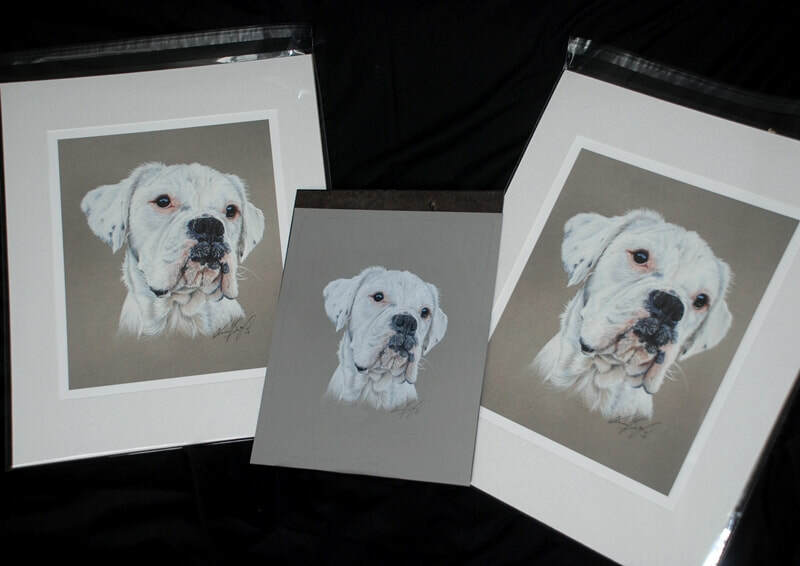 Open Edition prints available in A4 and A3 presented in a cream mount to fit standard size frames. More available Artworks and prints will follow - do come back soon! 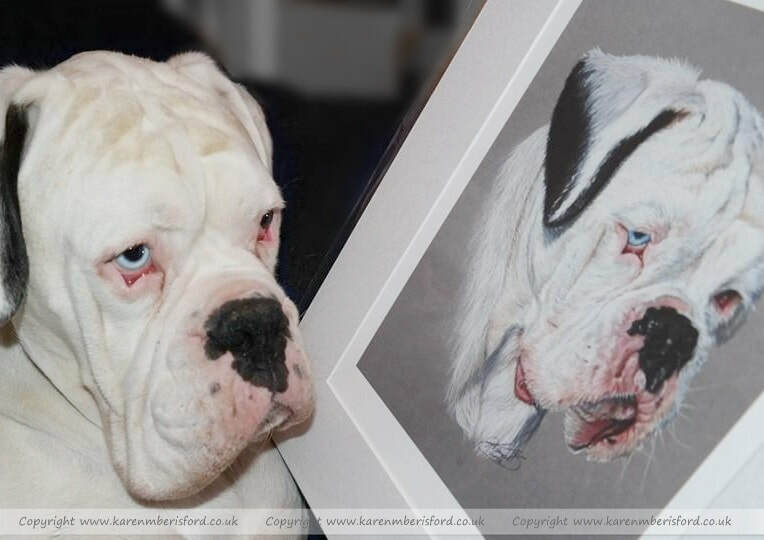 Whenever you book a Commission, there may be friends and family wanting a copy too so why not order prints of your portrait, as many or as few as you like! 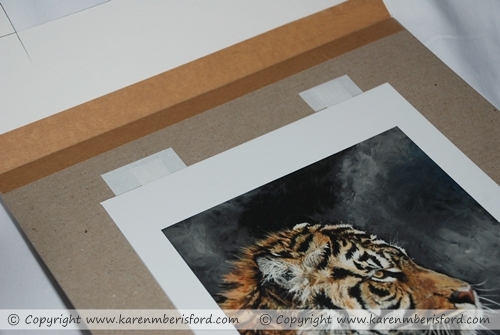 ​Please note: When ordering prints alongside the original Artwork, there may be a mild difference in tones/colours on the print as orders are photographed by myself and Emailed to the printing company. 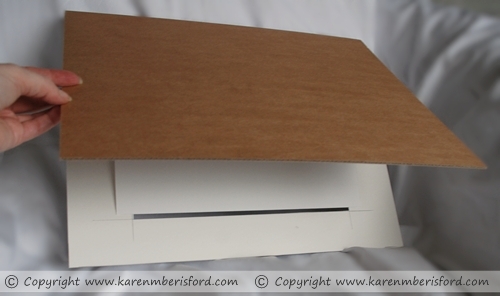 A proof print may be required before orders are printed. There is no strict standard for Giclee printing, but the Fine Art Trade Guild do however specify a standard for archival Fine Art prints and that standard requires paper to be at least 250gsm in weight with a low acidity level (pH7 to pH10), when such paper is combined with modern pigment inks in top-end inkjet printers the result is a very high quality print that you can be confident will last. Prints produced in this way can be expected to last many years. Accelerated tests indicate that 75+ years can be expected and quite possibly a lot longer. This is the process that my printer offers as he uses Epson printers with UltraChrome K3 pigment inks. Mounts are of archival standards using Arqadia mountboards. Seen a piece of Art on this website you would LOVE a print of? Just wanted to let you know that the print arrived safe and sound. Thank you so much for the care you took to package it, it arrived in perfect condition. 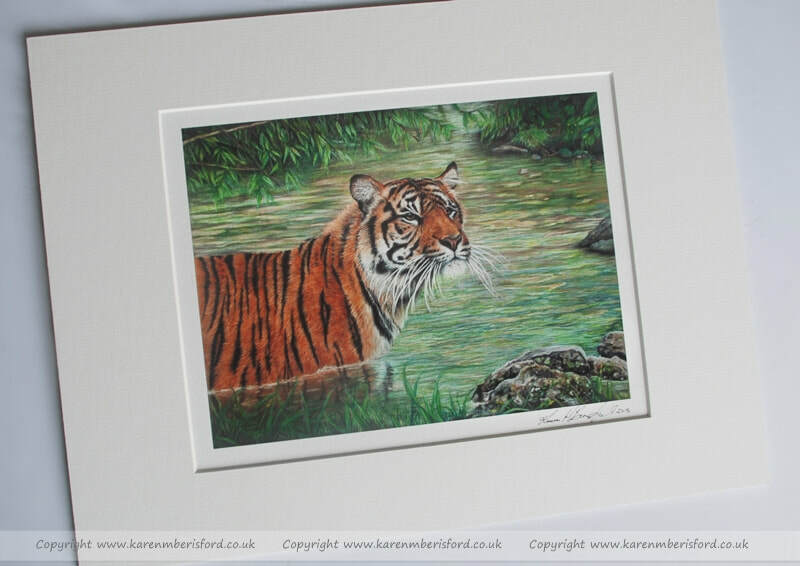 We were all thrilled with the print- it's fantastic and you are really talented! It was the perfect anniversary present for my sister. What can I say??? I’m speechless!!! The painting is everything I hoped it would be and more. We both really love it and you’ll be pleased to hear that once we managed to unwrap it there was no damage. You have captured both boys magnificently and we will treasure it always. I am mesmerised by James’s blue eyes. I can feel them looking at me. My two boys together. The prints are just perfect and I know our parents will love them too. P & P is Free within the UK, if you are ordering outside the UK please request a postal quote, this will be given before your order is placed. Please provide your postal details and print(s) you wish to order.